12 pp. Roman, 188 pp. Tuareg is a Berber language spoken in the central and southern Sahara. It falls apart in numerous different dialects, each of which has its own special characteristics. In this book, Ayer Tuareg, the Tuareg spoken in northeastern Niger, is treated. It is among the best documented Tuareg variants, with large text corpora of high quality and great lexicographic tools. Different from a number of other Tuareg varieties, however, no grammatical overview of Ayer Tuareg has been available until now, except for a short sketch by Lionel Galand. Ayer Tuareg features a restricted height-based vowel harmony system, extended apophonic systems, both in verb and in noun morphology, as well as many interesting features in syntax. This grammatical sketch aims at introducing the structures of Ayer Tuareg to an audience with or without previous knowledge of Berber languages. As such, it should be interesting to typologists and students of Afroasiatic linguistics in general. It provides an introduction to the linguistic study of Tuareg in general, both by explaining the basic analyses proposed for certain features and by providing comparative material from other Tuareg dialects. It is hoped that, with this tool, it will be easier for those interested in Ayer Tuareg to use textual and lexicographical material. Further manuscripts and numerous contributions to collected papers by Maarten Kossmann can be found by the author’s index. 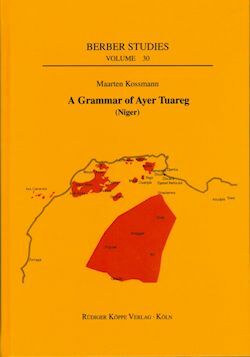 This grammar of Ayer Tuareg was written to provide a practical introduction for non-Tuareg speakers to one of the most important Tuareg dialects in terms of number of speakers. It fills an important gap in our documentation of Tuareg, since such an elementary grammar based on the much increased linguistic data of the last 30 years did not exist. [...] The author’s transcription of Tuareg is on the whole extremely reliable. The exposition of the different grammatical features is considered and done successfully, so that this grammar will undoubtedly render good service to any scholars wanting to do fieldwork amongst the Tuareg, although of course, people with a basic linguistic training will find it easier to use.